Notts County assistant boss Greg Abbott believes referee Richard Clark may not have sent off Kwame Thomas against Doncaster if he realised the striker had already been booked. Thomas was cautioned for leaving the pitch too slowly in Tuesday's 0-0 draw. But Clark only realised it was a second yellow when Thomas was in the dugout having been replaced by Billy Daniels. "In hindsight the ref - maybe - would have thought twice if he had known," Abbott told BBC Radio Nottingham. "In defence of the referee, if he had realised it was his second one he would have run over and ushered him off without the card. I have never seen a sending off like that. "But once he has shown the yellow he has no alternative, so he has to go." 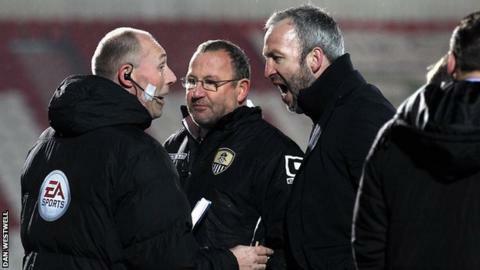 Magpies manager Shaun Derry was also sent off for protesting about the 87th-minute dismissal in the League One match, meaning Daniels had to return to the bench. "You can't sub someone that has been sent off unfortunately," Abbott joked. "That's Billy's shortest spell on the pitch. "I can't believe he has gone on, thought he was getting his appearance money and gone off and won't get a penny - not knowing Jim Rodwell (club chief executive) he won't. "It's a double-whammy so we will have to chip in and help him out. Jim will be disgusted he is getting battered for something one of his players has done. "It was chaotic scenes at the end and the game could have done without it because it got a bit messy."